VietPress USA (April 14, 2018): US-British- French Joint operation fired at least 103 missiles from warships, Submarine, military fighter Jets and B-1 Bombers that hit successfully every targets on Friday, April 13, 2018 at 9:00pm EST (or 1:00am GMT) or 4:00am local time on Saturday, April 14, 2018 in Syria. Syrian National TV announced that Syrian Air Defense system shot down 13 Missiles from American attack.. But Russian announced that Syrian land-to-Air rockets destroyed 71 missiles from 103 missiles launched by US-British-French joint attack. On April 11, 2018 President Trump warned very early in advance to Russia on the missile nice, new and "smart" launching over Syria; but the attack coordinated between US-UK-France fired on Friday, April 13, 2018 at 9:00pm EST. This means that Syria has enough time to evacuate almost air-crafts, chemical weapons or Military troops. 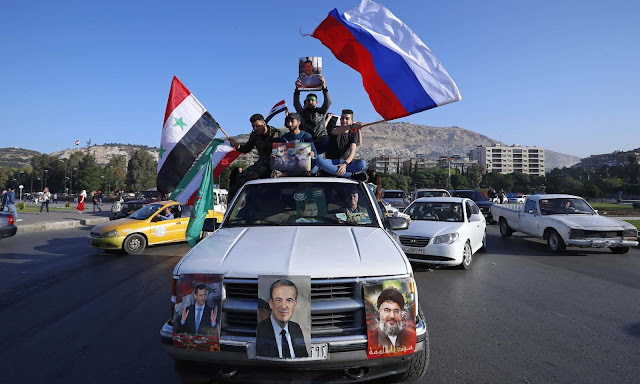 On Saturday, April 14, 2018, Hundreds of Syrians poured into the streets of Damascus, waving flags of Syria, Russia and Iran, dancing and chanting in defiance of what they called the West's "failure" to shake their nation's resolve with airstrikes. DAMASCUS, Syria (AP) — Hundreds of Syrians poured into the streets of Damascus on Saturday, dancing and chanting in defiance of what they called the West's "failure" to shake their nation's resolve with airstrikes that jolted the capital only hours earlier.